As the Mizen Art Gallery has been enjoying the presence of major works of Okinawa ceramic art, it might be a good time for some history. Free and dynamic art styles became widely incorporated into the Japanese artistic movement known as Mingei. This period marked a return to simple and solid concepts. Shapes designed during the Mingei period were largely based around the idea of natural beauty. What might be the most surprising to historians about this movement is its modernity. Mingei artists only really became a force in 1925 or so, and stressed the appreciation of crafts from a long existing tradition. 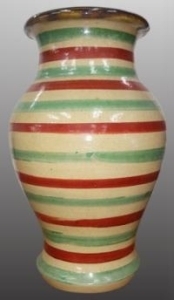 This tricolor vase by Kobashigawa Eishou (1909-1978) is an excellent example of Okinawa’s unique school of ceramics. Ironically, many of these artists also emphasized breaking with tradition. Yanagi Souetsu defined the movement as natural, sincere, secure and simple when discussing the impetus of the movement in 1933. Irony seems to be a major concept too, and it was this particular irony that influenced Okinawan artists so much. While Mingei movement artists stressed nature, it was largely due to the growing forces of urbanism in the world at the time. They wanted to revive traditions, yet not be consistently bound to them. Everyday objects were emphasized instead of merely special ones, which makes sense considering that this movement was made to emphasize folk art largely. Once again this emphasis could indeed have come from the fact that such art was made to stress a sort of back to basics situation that turned away from the very mechanical society people were starting to live in. 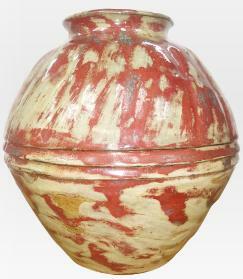 This Yohen vase by Aragaki Eizaburo (1921-1984) has a rather unique finish, and comes from the famed Naha region. Common objects included those made from textiles, metal, lacquer, wood and naturally ceramic. Yanagi Souetsu was the initial master of the style, and he heavily reaffirmed the value of traditional crafts. Hamada Shoji and Kanjirou Kawai were master potters who created ceramic art from the beginning along with him. Interestingly enough the movement started to spread internationally after this. This shouldn’t come as too much of a shock, however, when one considers how separate of an identity Okinawa has really maintained. This is perhaps because the values that it espouses are ones that could be enjoyed by people across the entire world. As the world becomes increasingly mechanical and artificial, people are more likely to turn toward traditional aspects of life in the hopes of finding some solace. That means that the same sorts of movements that influenced Okinawan ceramics artists years ago will continue to shape and grow with modern styles of art.